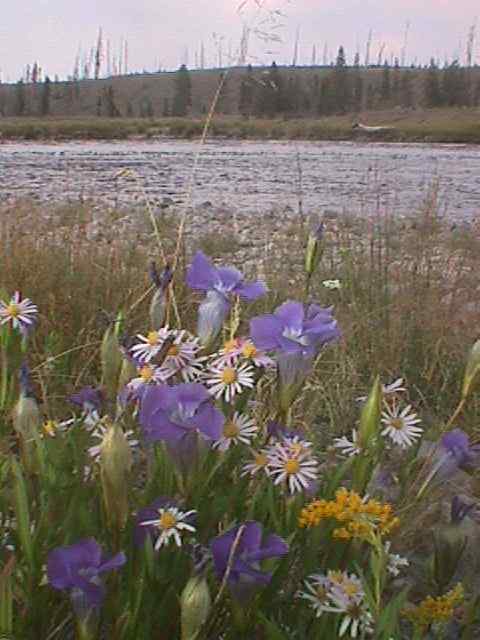 We have three plots in the Yellowstone backcountry. Before that, from how the job hours fall, we have nearly a week off in the town of West Yellowstone, Montana, on the western edge of the Park. This has not been a real backpack intensive summer so far. I plan to use the free time to get ready. Practice. I get my full pack together, everything but the hardhat. Don’t want to be too much of a spectacle, hiking through town. I head out walking to explore the local area. I end up hiking some of the most uninteresting terrain of the entire park, the Boundary Trail. Well, who’s to say it’s uninteresting? It’s flat, dead flat. And that’s interesting. For miles south of town, the trail runs across a plain that does not even have one twenty-foot contour interval on the topo map. How did it get that way? Flat land anywhere on the planet has a story. It doesn’t happen by accident. The story may be that no geological upheavals have happened in a remarkably long time. But near Yellowstone, that doesn’t wash. With all the thermal spewing, you know the earth has just taken a brief coffee break from geological upheavals. I wouldn’t buy real estate there! So why is the Madison Valley so flat? There are no old meanders of the Madison River, as if that waterway had filled it in. There are no glacial moraines, like it had help from ice sheets. Maybe an old lakebed is all I can guess. But what dammed the lake, and where did it go? There are no gradual slopes on the sides, the old shallows. No wave cut terraces. No alluvial benches. Unless the whole thing is a bench. Interesting. Finally, about three miles south of town, I come to a range of hills. The land rises abruptly, and the trail vanishes. 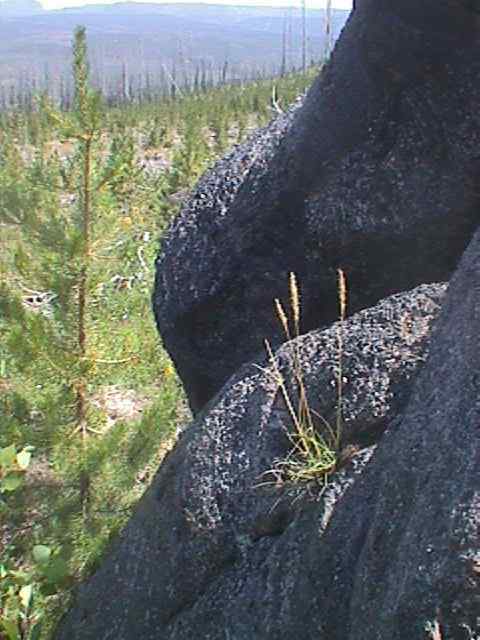 This was part of the Yellowstone fires twelve years before. There are standing blackened poles, but overall the land is green. Lodgepole pine knows exactly what to do with fire. Die. But plant the new forest at the same time. The species has tight little cones, hard as walnuts, that hang on for years and don’t tend to open much until the temperature goes way over one hundred. I see the evidence that thousands of tiny winged seeds sifted out into the cooling ashes. Twelve years later, there are miles of little green pine trees. Climbing the hills means stepping over many burned logs. The fire is still obvious. Even the land looks burnt. Few of those shiny black granules are charcoal. It’s obsidian. I have never seen so much of this black volcanic glass. It seems these entire hills are made of it, or its brother pumice. Obsidian is just pumice without the bubbles, and vise versa. Here, as usual, they’re mixed. In my 20’s, I went to New Mexico with a college roommate. Among many other places, he took me to Tent Rocks, which I now know must have been volcanic ash. Erosion was shaping the white deposits into conical spires. In the outwash we found smooth shiny black pea-sized pebbles he called Apache Tears. Obsidian. I collected a few, not knowing if we were supposed to. Around here, I could take a dumptruck load and nobody would notice. Now that I think of it, the entire plain around West Yellowstone is made of these obsidian granules. I wonder they don’t sell them as souvenirs. The boulders that make up these hills are tumbled and smoothed. Was this an obsidian flow? 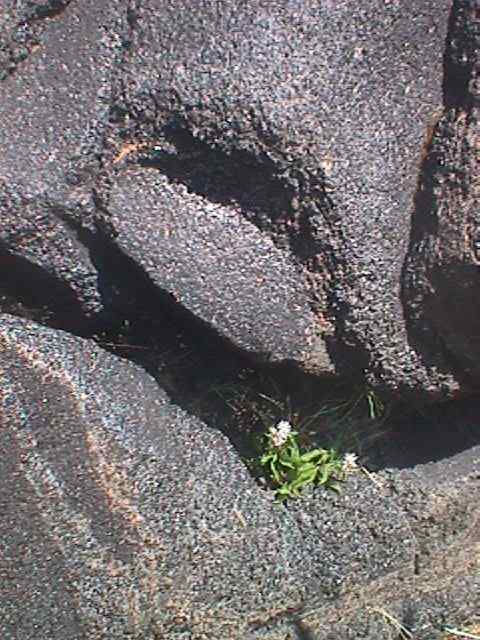 Or did the black glass solidify somewhere else, then get moved here by later eruptions? Or glaciers? 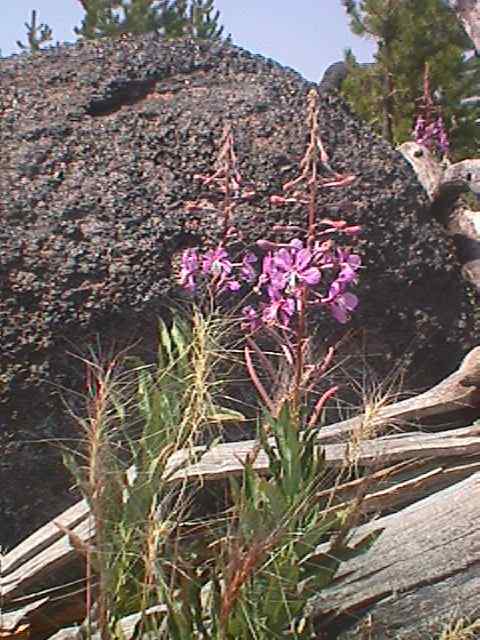 I try to capture the exotic shapes and textures of the rocks by photographing them with wildflowers in the foreground. I don’t know if I succeed. There are wild strawberries ripe, and the kind of tiny huckleberries they call whortleberries. Both a treat. I explore the hot, burnt land a few hours, then head down. Later, looking on a map, I find I was in an area called Jackstraw Basin. The name is right on target. Even before the fires, it must have been a tumble of fallen logs in each drainage. Now, it is some of the most difficult going I have ever encountered, on a par with postholing four-foot-deep snow, or threading clethra and greenbriar thickets on the eastern seaboard. But it’s funny, it doesn’t look hard. From up the hill, it appeared almost like a lawn. Little green pine trees. A few feet tall. Not. In the thicket, half of them are as tall as me. They do not seem to be an obstruction. I can look over them. I can see the trail, wide as a road, right down over there! But they are thick, so thick in many places I cannot set a boot down level. And they hide the fallen logs. Few of these logs are much more than a stepover. Yet it means I can never make one single swinging stride of gait. It is all a dance. Dancing is fun, but not in a menagerie. The little springy saplings push and nudge at me and my pack, setting me just the slightest bit, unexpectedly off balance. In ten steps, I want to rest. But there’s no place to sit down. I look up, and the trail is right over there! I learn to stay on the drier slopes and steeper ridges where the trees don’t do so well. Routes that look more rough. In a few years, some of this land is going to be incredible. The pines will be overhead, to where you can’t see where you’re going. But not yet thinning and shading each other out. Like an endless, trackless cornfield, with no rows. But nature has a job to do, putting the forest back, and it’s not all at our convenience. Back in West Yellowstone. People compare it to Jackson Hole. But it doesn’t have the scenery, or the class. Well, the smarm that passes for class. I don’t mind. I like it. It’s the one place all summer I don’t have to close the motel room drapes at night to shut out glaring lights. Across the street there’s nothing, just Yellowstone Park land. I can take my compass and run on an azimuth of sixty-five degrees through that absolutely flat and utterly trackless pine woodland. In about forty-five minutes, I come to the nearest bend of the Madison River. I expected it would be icy cold, as mountain rivers usually are; but the water is quite temperate. Maybe all that thermal influx upstream. Madison River and the Yellowstone Burn. When I’m ready, I go back to the same tree where I came out by the river, turn the compass around, and head into the woods. Unlike most western lands, there are no cowpaths, and no cowpies. Just endless pines. In a little less than an hour, I pop out of the woods, right by my motel room. Categories: long posts, what's up | Tags: environment, nature, outdoors, slice of life, travel | Permalink.